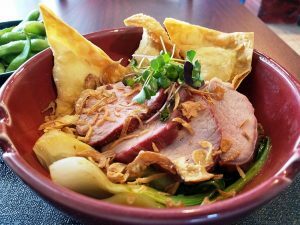 When Garland first opened up as a take-out window under Kings Barcade, I stopped in and did a rice bowl take-out for a meal and thought it was decent but not quite amazing. Fast forward six months later and Garland has expanded into a full dining-room and gone through a huge upgrade. 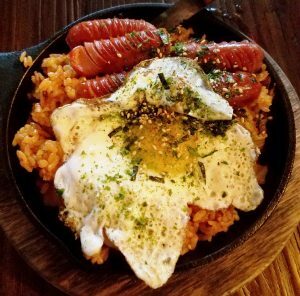 Online reviews were excellent but the memory of my first meal stuck in the back of my head so I didn’t make a huge effort. Then a good friend of mine told me he felt Garland was easily the best new restaurant in Raleigh so my curiosity was piqued. I figured it was time to give this pan-Asian eatery a try and so, five of us headed on over for a Thursday night dinner. 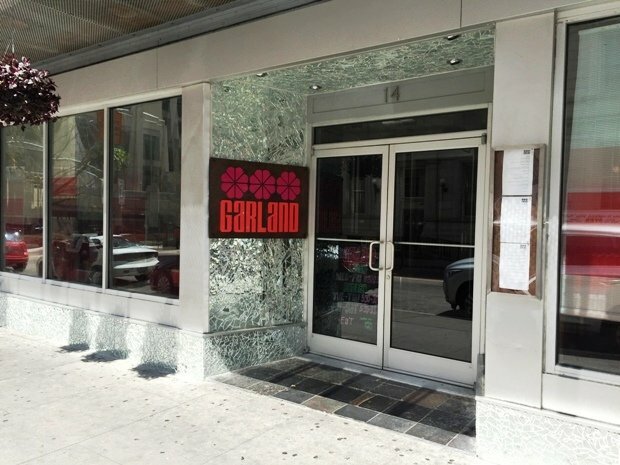 Out front, Garland has a distinct, retro and funky look. Silver-plated, mirror like swirls, a metal grate ceiling in front. You open up the door to an eclectic looking space with right-hand side-bar, front room waiting area and lots of paintings and prints in back. Very interesting decor. There’s a bit of wood warmth, creative hipster and chic modern. The table has cut crystal bottles holding small flowers and the staff is all pretty young and beautiful. We get a round table in front and given I’m with experienced Garland diners, I rely on them for helping me choose my first meal. The cocktail menu at Garland is solid with plenty of interesting twists. I go with a Modern President which is coconut-infused rum, vermouth, cinnamon bark and bitters. It’s a delicious drink with a hint of the tropical but the smoothness of a classic drink. 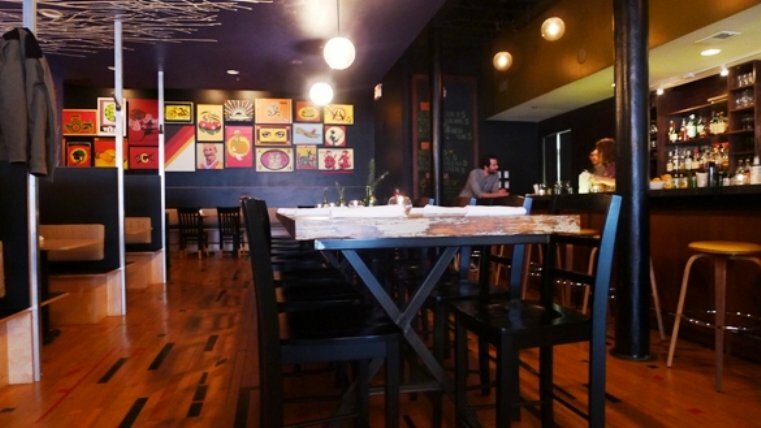 The wine and beer list is solid at reasonable prices. 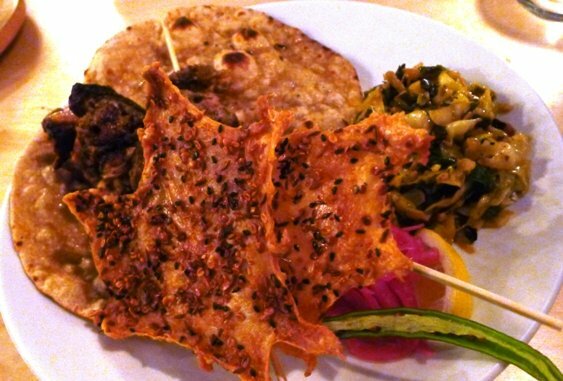 Around the table we order an array of appetizers ranging from chicken and cauliflower 65 to a pakora on my side. As the apps come to the table, there’s a lot of passing around and horse-trading so we can try it all! Love the pakora that comes out as a crunchy bird’s nest with tamarind and cilantro chutneys. Fried nice and brown without being greasy, it’s a fantastic starter. 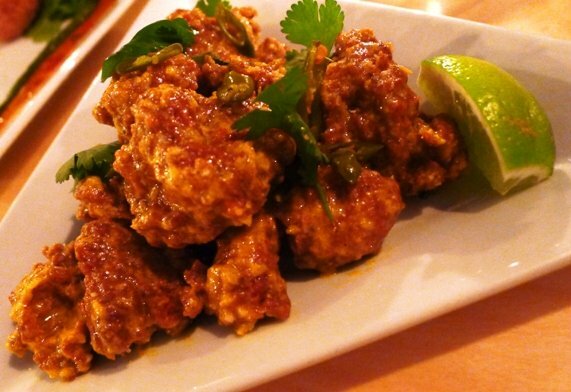 The 65 apps come with a thick, flavorful and spicy coating, yum! In cauliflower or chicken form, it’s all good. So great start so far for Garland between the cocktails and apps! My main is the braised pork belly with black rice cake, parsnips and fennel. 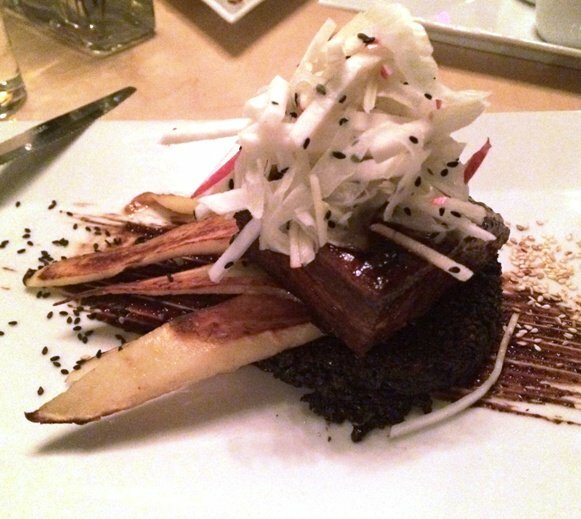 It’s a sensational looking dish, thick piece of belly with seared parsnip slices underneath, a fennel-turnip slaw on top and sprinkled with black sesame seeds. The pork belly is cooked just perfectly with the meaty richness that only this cut can deliver. 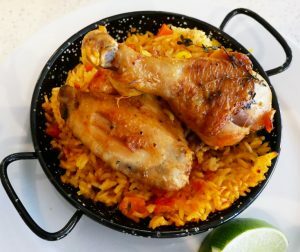 Paired with the crunchy and savory black rice cake along with the veggies, there’s a lot of deliciousness in this plate! 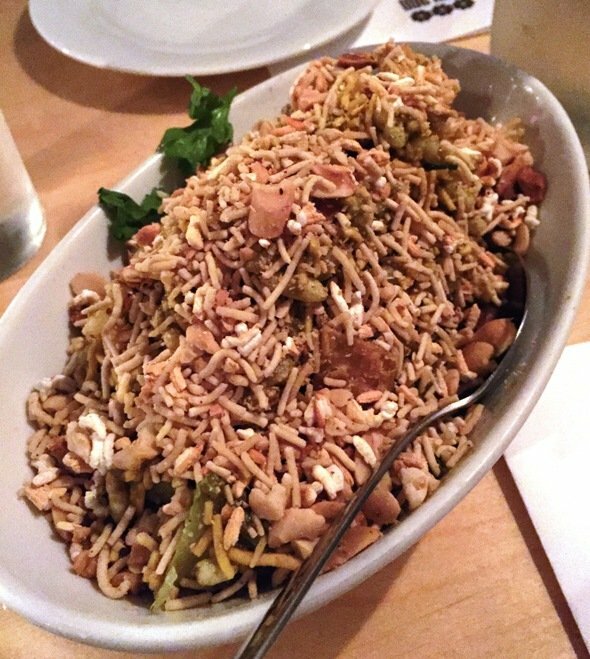 And the sesame seeds adds a bit of clever contrast to the dish along with a bit more flavor, impressive. 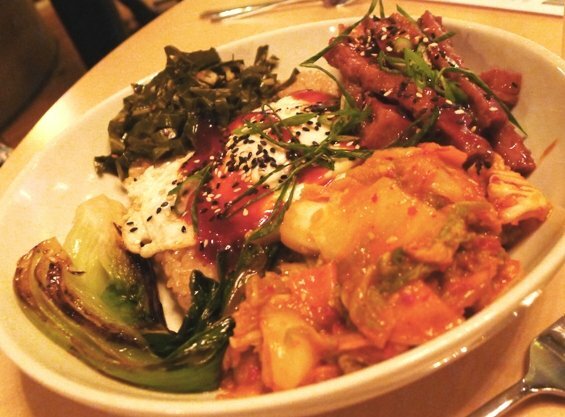 The other dishes, ranging from rice bowl to vegetable curry looks pretty amazing too, next time! The table decides to skip on dessert but I head on back to use the men’s room. And whoa! 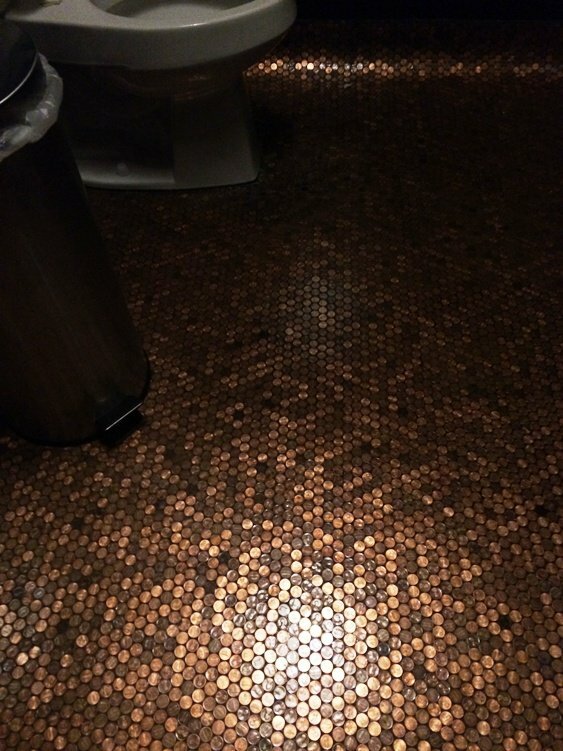 Very cool floor made of pennies which is literally and figuratively, brilliant. As I head on back to the table I notice the kitschy paintings in back, a silver shadow image of a tree on the side-wall and more. All the decor at Garland is well-thought out with a lot of care, just like their food. Along with the solid service and cool, front waiting area, the place screams “Love me” and you probably will. That was supposed to be “must try”. Can’t type.